Like knitting technique, crochet stitches consist of interlocking of loops. However, unlike knitting, loops are formed with only one needle or hook. By manipulating the single needle or hook, it’s easier to crochet than to knit. Beginners generally learn how to crochet by first learning how to properly hold the crochet hook and yarn. Hold the hook in one hand and the yarn over the index finger of the other hand. There is specific compatibility between crochet hook sizes and yarn weight. The first step to learn how to crochet is to practice the “chain stitch.” This is done by making a slip knot and placing it on the crochet hook. Other fancy crochet stitches include: Star stitch, Lacet stitch, Shell, Shawl, Fancy Puff, Afghan and Afghan cable,to name a few. Beginners should start by making a foundation chain of about 10 chain stitches to create stitch gauge. At the last stitch, insert the crochet hook into the nearest chain in the lower end of the previous chain stitch. Repeat with the remaining chain stitches. Turn again to create the third row. These are single crochet stitches. To make a double crochet stitch, insert the hook into the fourth chain from hook and draw up a loop. There will be tree loops on the hook. Draw through 2 loops, yarn over and draw through the last two loops. Notice the double crochet stitch is larger than single crochet stitches. When you purchase crochet hooks, use a hook size chart for compatibility with yarn weight. The size of the crochet hook determines the overall size of the finished crochet work. Study a hook size chart to become familiar with variables in hook sizes. The smallest hook sizes work well with crochet thread. The larger size hooks work best with yarn. Crochet thread and yarn are sold according to ply size. 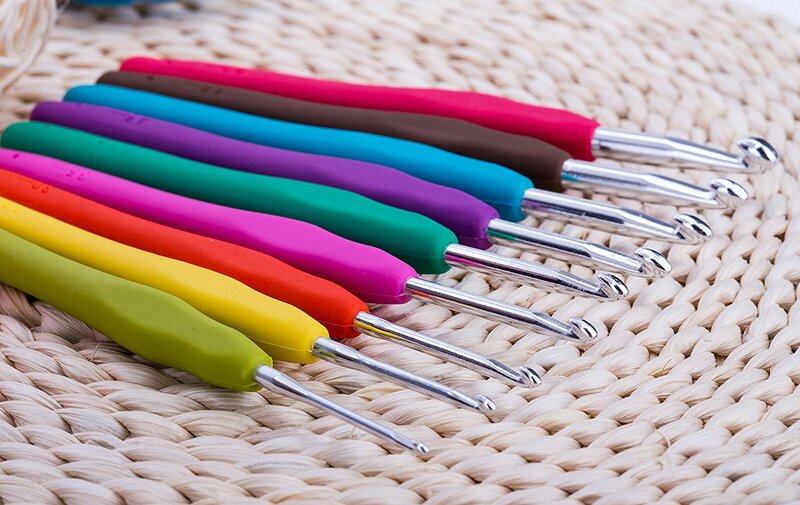 Crochet hooks are sold according to metric diameter from 2.25, the smallest size to 25 mm, the largest size. Each size differential is listed on the hook with an alphabetical letter. For example, 2.25 diameter hook is a crochet hook size B-1. A 6.5 diameter hook is listed as K-10.5. When purchasing thread and yarn, purchase sufficient quantities to complete your crochet project. Also, check labels on thread and yarn to ensure weight and colors are the same. Advanced crochet proficients often create their own designs for blankets, shawls, capelets, ponchos, hats, scarfs, coverlets, place mats, toys and holiday ornaments. Consider crocheting a vest, skirt or sweater using the cable afghan stitch and a large crochet hook Q, S or U. For really fanciful crochet work, use the Loop Stitch. This is a distant relative of hairpin lace and netting. For the Loop Stitch, you’ll need a 1/4, 1/2 or 3/4 inch wide and 3″ long piece of cardboard or a tongue depressor. Make a chain to desired length, work a single crochet in each chain stitch. In Row 2, hold the cardboard or tongue depressor in back of the work. Insert the hook in the next single crochet, wind yarn around the cardboard from back to front, yarn over hook, draw loop through single crochet, yarn over again and draw through the first loop. Yarn over and draw trough two loops on the hook. This stitch looks great with mohair yarns and creates a unique design for shawls, scarves and ponchos. Advanced embroidery work like patchwork, tufting and quilting are a good opportunity to make use of crochet designs. Choose an embroidery pattern that coordinates well with the addition of crocheted edges. For example, finish an embroidered throw or pillow with lacy crocheted edges using a small crochet hook size, color coordinated crochet thread and picot or open mesh crochet stitches. There is something quite special about shopping for embroidery and crochet supplies. Shopping online is convenient. Visit sewartsy.com today and enjoy a sewing shopping spree to help you create artistic gifts for family and friends. Shop at SewArtsy for your sewing needs or for gifts for your sewing friends and family.